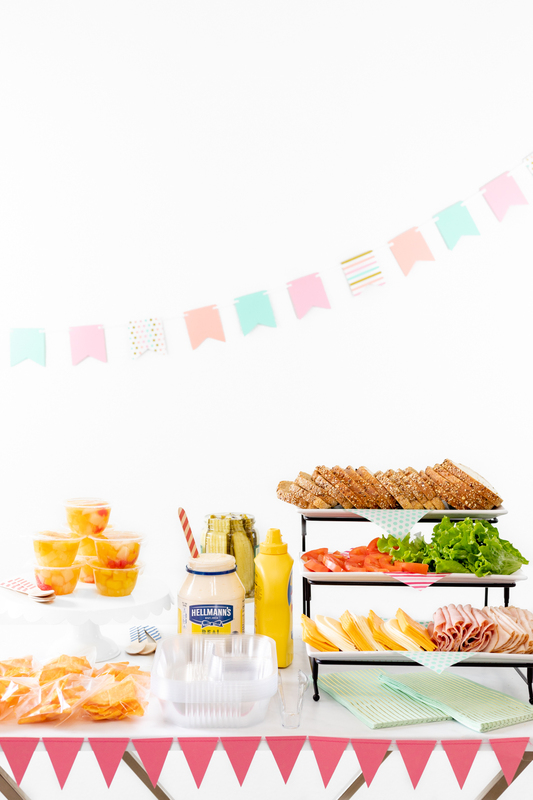 I’m feeling a spring in my step and with that, more fun party ideas are on my mind. 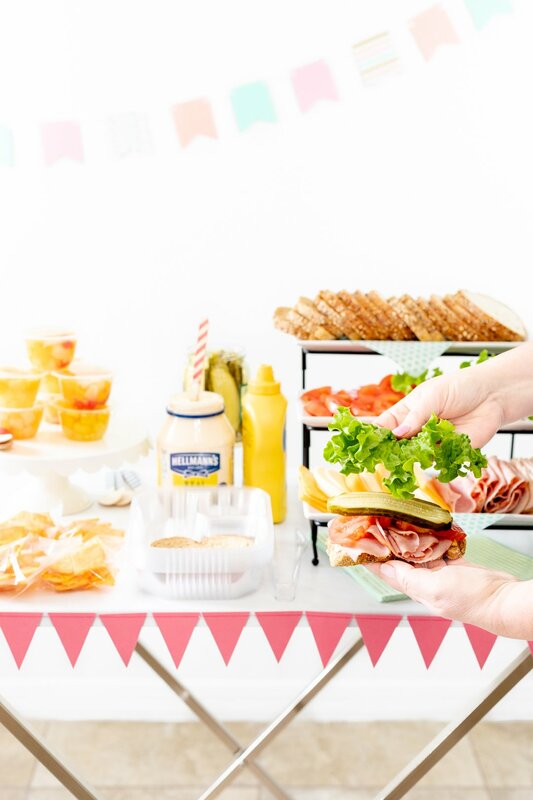 Whether a fun family gathering or larger spring soiree, this DIY Sandwich Party Station is such a fun way to host a special lunch at home. As always, I like to keep things as SIMPLE as they are fun. Enter this super no-fuss lunch inspiration with so many scrumptious options that everyone will be sure to love. Making it extra memorable is easy with special touches like choosing freshly baked Publix Bakery bread. Yum! For this delish spread, I chose their Italian Five Grain Bread and 100% Whole Wheat Five Grain Bread. Not only do they smell amazing, but they taste amazing, too. 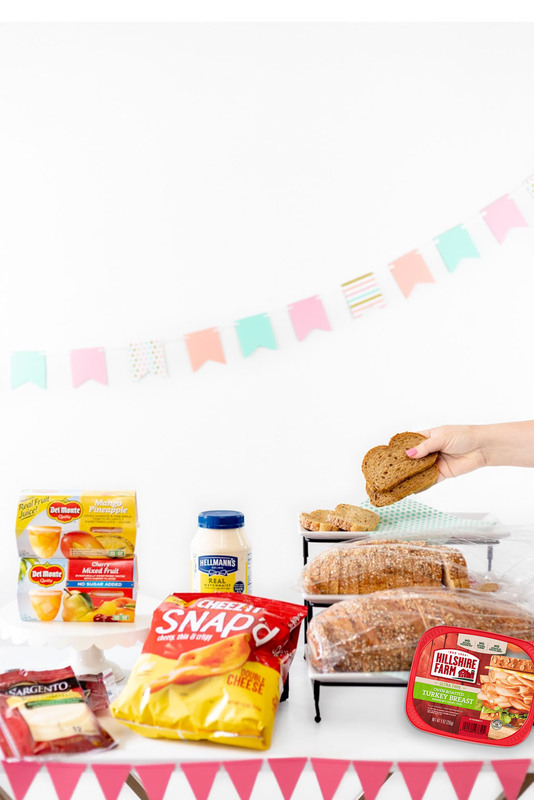 Right now happens to be a perfect time to host a party because you can take advantage of some great deals on Publix bakery items when you buy select items that are great to stock up on. 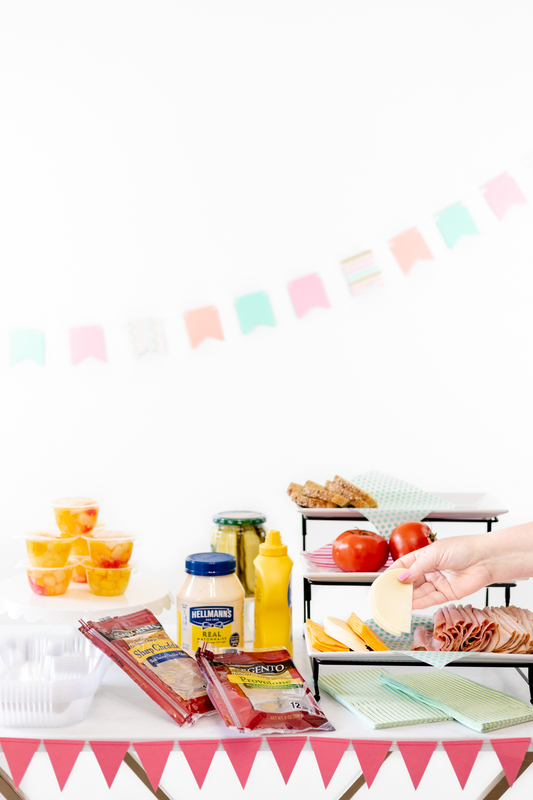 Enter other sandwich party must-haves like Hellmann’s® Mayonnaise, Cheez-It® Snap’d™, Del Monte® Fruit Cups®, Hillshire Farm® Lunch Meat, and Sargento® Sliced Cheese. Keep on reading for details. Now back to the sammy fiesta! Add on the layers of goodness. 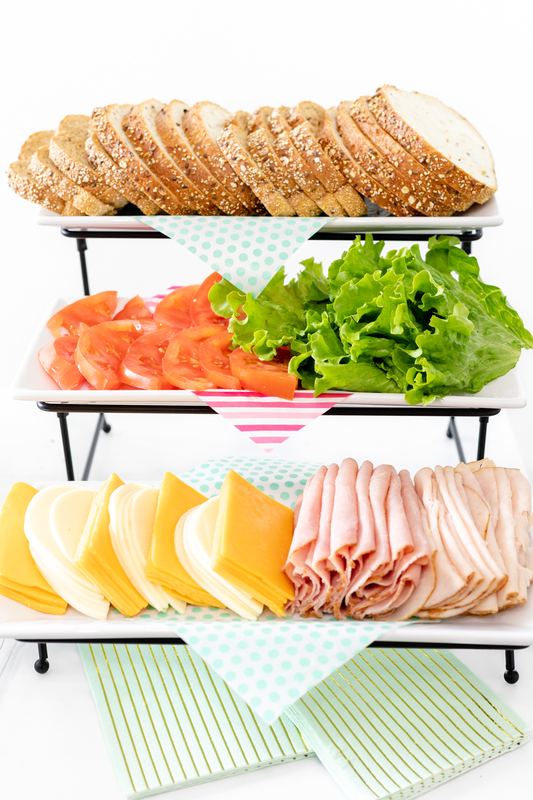 A tiered tray is perfect for this, but you can set out toppings in so many ways. Think individual dishes or a larger platter to showcase the OPTIONS. Because, let’s be honest… it’s all about those options. Get the basics together first; think a nice selection of meats and cheeses or for a twist, you could do salads like chicken, egg salad or tuna. I chose Sargento Sliced Cheese in Provolone and Sharp Cheddar to offer a good selection as well as Hillshire Farm turkey and ham for this. Then, add a selection of veggies. You could keep it basic by offering sliced tomatoes and green leaf lettuce or make it more elaborate with sliced onions, cucumbers, carrots or sprouts. Then, don’t forget the condiments. 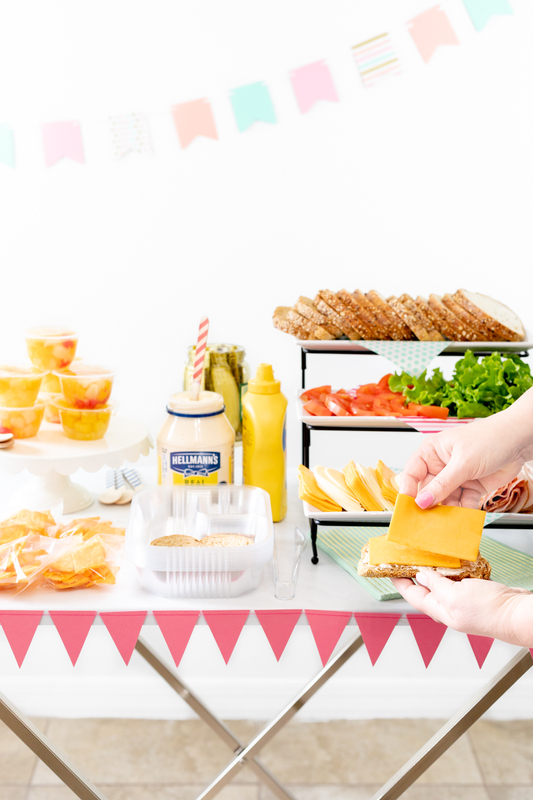 Hellmann’s Mayonnaise, mustard and pickles are the perfect addition to your tasty spread. If you want to get even more creative, add some flavoring to your mayo like garlic, hot sauce or maybe a little squeeze of lemon. As a final touch, make sure to serve up some tasty sides. I’m a sucker for cheesy snacks that are crunchy. I just tried the Cheez-It Snap’d snacks for the first time and yum! They are the perfect sidekick to a tasty sandwich. For another side or simple dessert, Del Monte Fruit Cups make for a fun option, too! Now, it’s time to make those sandwiches! This is the very best part, of course! It’s time to stack, stack, stack those toppings on your choice of delicious bread. Have fun with it. You deserve it after all of your work putting this together for everyone. Yum! Just look at that sammy! This combo is totally a keeper! 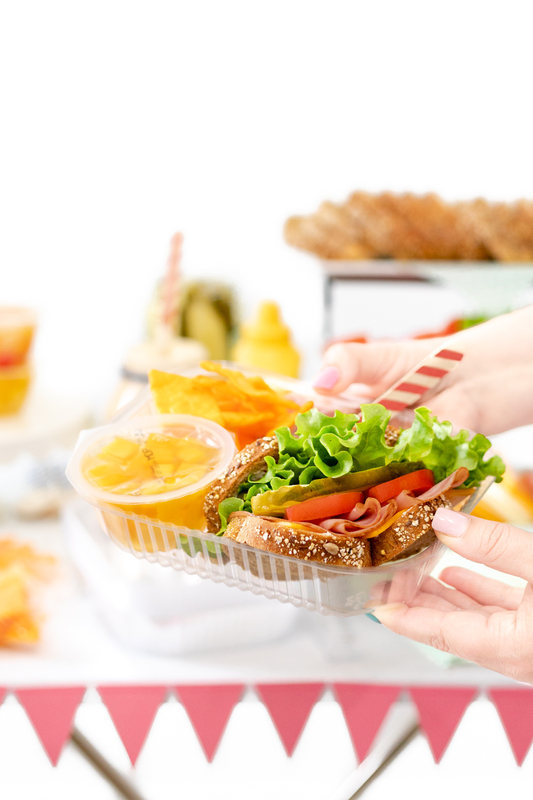 Don’t forget those sides and extras for the perfect combo that everyone will enjoy. Remember… options are everything! $1.75 off any Publix Bakery item when you buy any (1) Hellmann’s Mayonnaise 23 – 30 oz. OR Vegan Dressing & Sandwich Spread 24 oz. $1.50 off any Publix Bakery item when you buy any (2) Hillshire Farm Lunch Meat 7-16 oz. 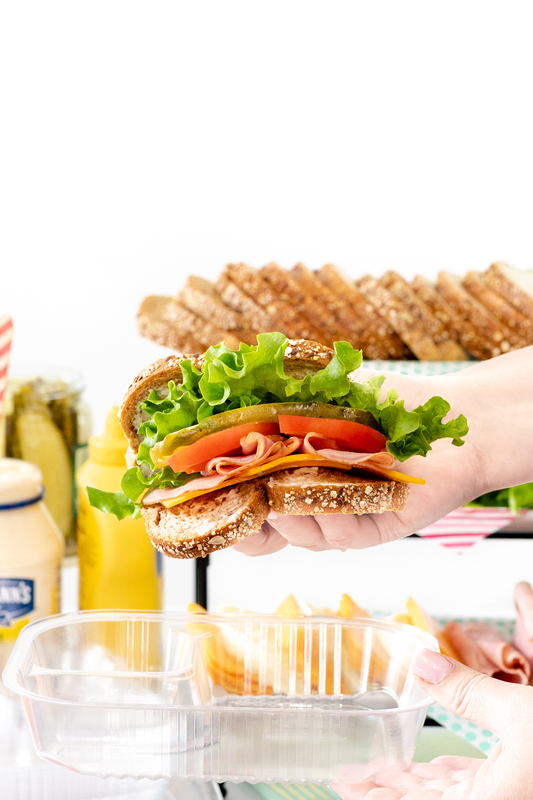 What toppings would you add to your own sandwich buffet?